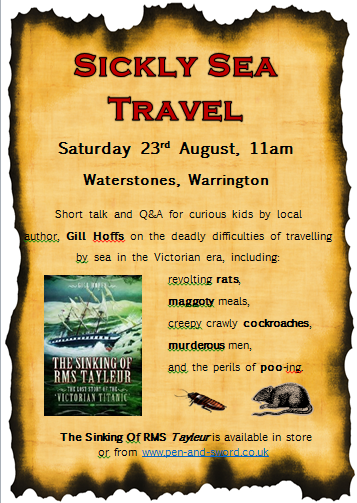 I’ll be appearing at Waterstones in Golden Square, Warrington, on Saturday 23rd August at 11am with a reproduction chamberpot, plastic rat, and genuine Victorian clothing including corset and bloomers – NB: I won’t be wearing them, they’d never fit – to talk about crinolines and crapping, being sick in a storm, and why you might be glad of rats on your vessel (they’re a more edible meal than putrefying pork). 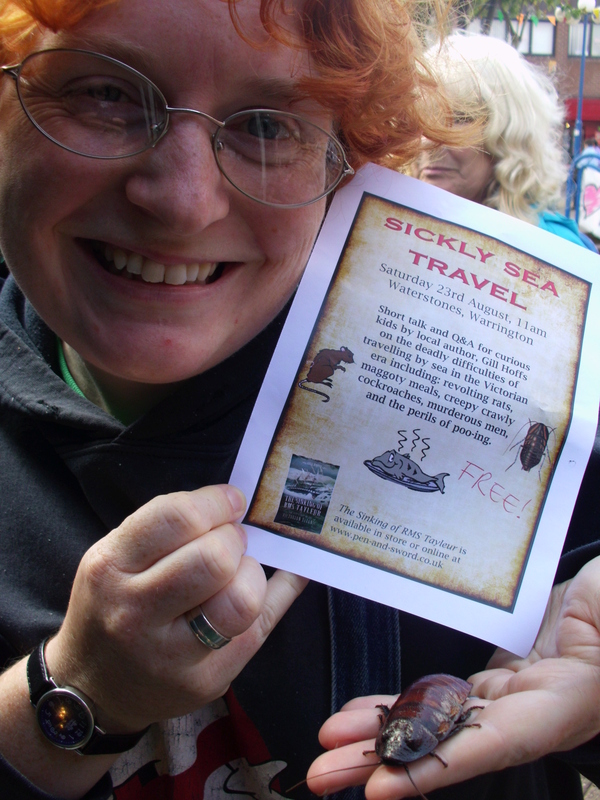 Everyone’s welcome, it’s free, lasts about half-an-hour, and questions are encouraged – whether on Victorian sea travel in general, or Warrington’s own Titanic, the ill-fated RMS Tayleur. If you can’t make it but want to know more, please feel free to contact me on twitter (@GillHoffs) or via gillhoffs@hotmail.co.uk. Waterstones has excellent wheelchair access (and parking above and below the mall). If anyone with mobility or communication issues such as mutism/autistic spectrum disorder would rather ask about it in an online chat or as a one-to-one in person then do let me know. If you want to read more, the new issue of Discover Your History includes my article “Travels and Tribulations” (downloadable here for £1 http://www.history-hub.com/dyh/article/307/Travels-and-Tribulations) – you can have a nosy at the first page by clicking on the link. Yes, I’m using a cockroach to pimp my book. His name’s Colin and he’s a cutie.